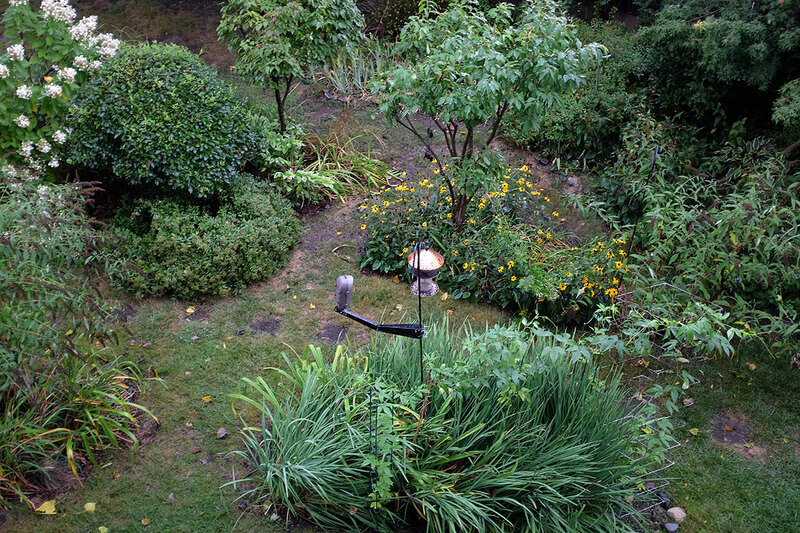 We had been thinking about how to set up the Audubon BirdCams in the garden. We could have used the stretch cords which came with the camera to mount it on a tree, but we wanted to position the unit closer to the action. There are a few different bird feeders in the garden, and our intention is to point the BirdCam at each of them for a few days and see what we get. The best way to do this is with the Wingscapes mounting arm . It was designed exactly for that purpose. The mount arrived before Labor Day weekend and we posted a FirstLook of it earlier this week. Today we will show the installation and some of the pics we got from the setup. To power the camera, we decided to go with the eneloop rechargeables for the time being. We are interested in seeing how long a set will last in the BirdCam. 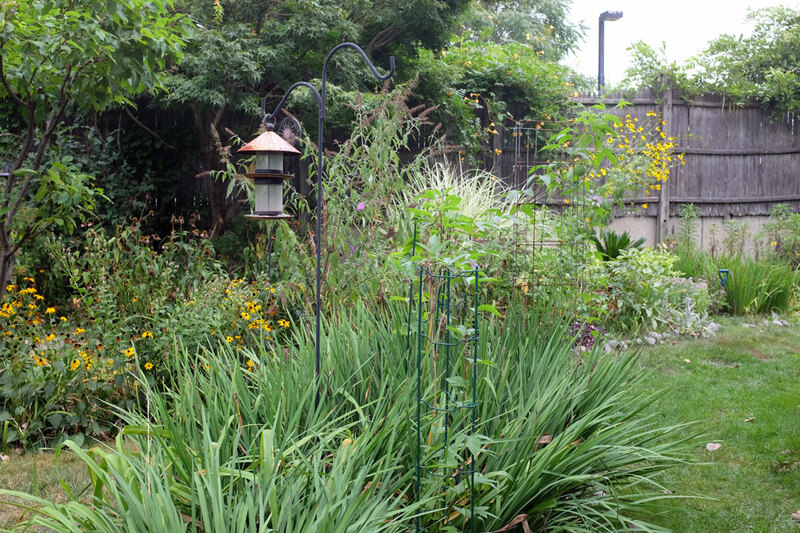 Using batteries also makes it easier to move the unit around the RainyDayGarden (rather than trailing an ungainly extension cord through the coneflowers). We will set up the solar panel to power the BirdCam once we have decided on the best spot. Hopefully that will happen before the end of Fall. The mount’s clamp can grip any pole with an outside diameter of between 1/2″ and 1.5″. The arm has an elbow so the camera can be brought closer or extended further away as needed. The gimbal at the end of the articulated arm makes it very easy to level the BirdCam. The entire setup was quite stable and had no problem either gripping onto the pole or supporting the camera. Setting up the rig took about 10 minutes. Enticing the birds to come to a feeder that had not been filled since April may take a bit longer. To help things along, we used Cole’s wild bird feed, because every time we’ve put Cole’s in a feeder, the birds leave that feeder cleaner than if we had washed it. So we like Cole’s because the birds like Cole’s. 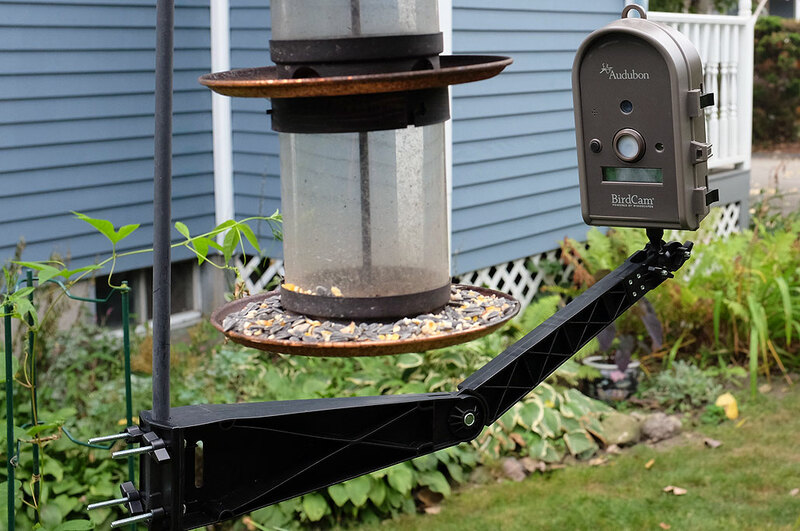 We found that using two poles (one to hang the feeder, one to mount the arm with the camera) was best for setting up the camera and the feeder. This is especially true if you want to fine tune the focus. While the camera has focus settings, they are marked for general zones. The only way to precisely set the focus is by physically moving the camera closer or further away in a trial and error fashion. Of course, while having two poles obviously makes things more configurable, using just one pole is simpler. The nice thing about the Wingscapes mount is that no tools are required as all the fasteners are wing nuts. The bright red laser pointer dot makes confirming the center of the image foolproof, even in daylight. The combination (no tools, laser sight) makes repositioning the mount onto another pole and getting the camera set quick and easy. Even though the copper feeder has been empty for months, it didn’t take long for the sparrows to discover that the buffet had re-opened. They weren’t quite sure what to make of the BirdCam at first, but once they realized that it was safe to land, they turned up the music and the partying got serious. Like any party, there will always be a fewwho have had “too much”. 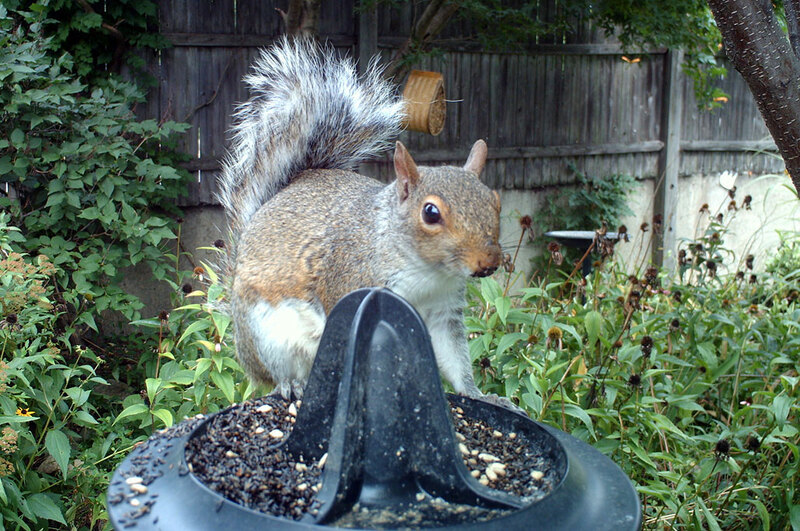 It wasn’t long after the sparrows landed that the squirrels realized that their favorite feeder was being stocked again. The first one came around noon and the second one showed up at dusk. Looks like we will need to mix in some cayenne pepper with the feed! Fall is fast approaching. It won’t be long before all this green changes into shades of red and orange. Our plan is to spend the next two months putting out different seeds to tempt as many different birds to come sit in front of the BirdCam for their portrait. We hope to have enough memorable shots to put a gallery together before the first snow falls.